I love personalized jewelry. 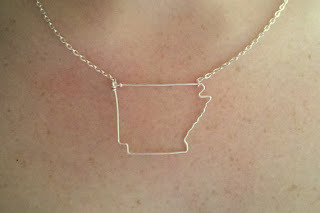 And the state trend is one I'm totally loving. So sweet and fun! Now I just need DC get in on that and I'll be all set! These come in both silver and gold. I love the way the name is spelled out in the state. 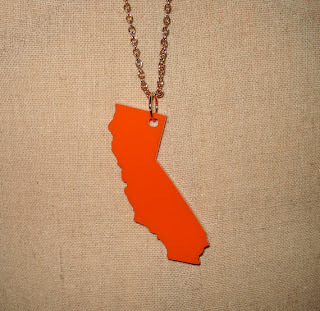 The orange enamel is a little more casual. And this one comes with a nice long chain. Simple, perfect, easy to pair with anything. How sweet and personalized are these pendants? I think they're so easy to throw on with jeans or layer up with other necklaces. 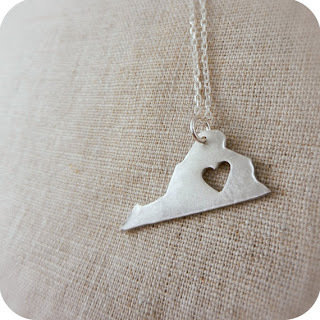 I love these kinds of necklaces, I actually have one pinned on Etsy that I want to buy. These are so adorable, only problem is I don't know which I'd pick as I have loyalty to a few states now!